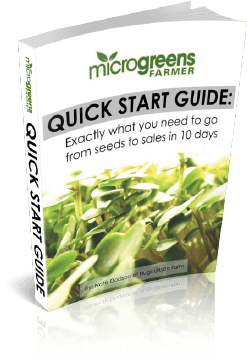 Want to sell more microgreens this year? For most of you, the answer is no. 90% of your focus is on just showing up and doing the work. Growing great microgreens, seeking more customers, and just general business basics. This is all good and necessary, but don’t forget that you already have customers and if you just look for ways to add more value to their lives, you will see increased sales and opportunities. So today I’m bringing you 20 things to consider as you spend some time focusing on how you can better serve your existing customers. I’ve included tips for selling to both wholesale (restaurant/grocery) and retail customers. Complete these tasks and you will see the results of increased customer satisfaction and sales for your business. I highly suggest you write down 3 of these on a notecard and try to get them completed in the next month. Many people are hesitant to buy microgreens because they don’t know if they will like them and they don’t want to waste their money. You are helping them to make a better decision by allowing them to try before they buy. If you don’t want to just plain give them away for free, consider offering them a free “Sample Pack” as an incentive for them signing up to your email list or trialing your CSA program (this is what I often do). When you are serving them the samples, it’s also the perfect time to start educating them about the amazing flavor and nutritional properties of microgreens. As you talk to them about the amazing flavor and nutrition of microgreens, offer them some flyers that go into more depth on what you are talking about. I always bring along flyers to handout about the nutritional benefits of microgreens, flyers about my “mightygreens delivery program”, and flyers with tons of recipes (all of which are included for download in my Microgreens Business online course – you can learn more about it and enroll by clicking here to attend a webinar). Why not give them a bunch of ideas for recipes so they can plan meals based around using your products. Just reading through your recipes will open their minds to the possibilities of cooking more with microgreens. I give away both recipe ideas flyers as well as this awesome little mini-recipe book pictured below. Even better than giving them some recipes, why not put on a demonstration cooking class teaching them your favorite ways to cook with microgreens? You might offer the free class two to four times per year at a local event center or even on your farm. Getting customers to actually see your operation in person will give them a deeper connection with your products and deeper understanding of the value you are offering. Plus, it’s a fun activity that entertains and educates them. It’s one step closer to forming a regular meaningful relationship with your customers. People don’t just buy because they like the product. They also buy because they like the people behind the product. Get people to like you more and they will buy from you more. The best and most effective advice from the classic book “How To Win Friends & Influence People” By Dale Carnegie (Affiliate Link) is to LISTEN and ASK QUESTIONS. People love to talk about themselves, so let them. Ask for your customers email address via a signup sheet at your booth and then shoot them an email the day before the farmers market reminding them of the event and that you hope to see them again and say hi. Many people appreciate the reminder to get to the market and will almost certainly stop by since you are the one who reminded them. SUBJECT LINE: We hope to see you and say hi! Don’t forget the Tuesday Farmers Market is on again tomorrow from 4-7pm in the street next to the near-westside Bloomingfoods. The Tuesday market has been great this year (much less crowded and distracting than the Saturday market). And the Bloomingfoods Coop market is right there so you can easily grab all the rest of your grocery needs at the same time. It’s going to be an absolutely beautiful mild evening, and we’ll be there selling microgreens, salad mix, flowers, turnips, radish, kale, and more – all grown just a few blocks away! Plus, we’ve got a new recipe we’d love to give you to try. If you don’t usually make it to the Tuesday Market, we encourage you to add it to your weekly routine and enjoy a more continuous supply of the freshest available local goodies. Not everyone has the physical ability (disabled, elderly, etc) or time to make it to every farmer’s market and focus on getting productive shopping done while they are there. So why don’t you just make it something they no longer have to think about by delivering to their front door every couple weeks? I offer this via electric-bike delivery through my MightyGreens Subscription program (http://hugsfarm.com/mightygreens/). Setting this up involves creating a recurring payment button on Paypal, embedding the button on your website, then following up with customers before each delivery via an email program like Mailchimp or ActiveCampaign (I’ve used and recommend both). I have found that not-to-be the case whatsoever. Most people simply do not have the time or desire to continue growing their own microgreens, but if you can get them to do it once or twice, they will have an increased familiarity and appreciation for microgreens and will therefore come to you looking to continue including them in their diet. As an example, I know how easy it is to make my own sauerkraut (definitely easier than growing microgreens), but I get lazy and oftentimes just buy it instead (not cheap!) because I love the flavor and health benefits, and it’s a regular habitual part of my diet. This might be a great class to combine with a cooking class (number 4 above). Lots of people already have their routines and buying habits fairly solidified and so you need to find a way to make it frictionless for them to purchase your products. One way to do that is to team up with a successful local CSA or food aggregator and just sell to them for wholesale prices and let them do the distribution. Grocery stores are also an option, but can be tricky because there is a higher food waste component, so they are typically not willing to pay as much and the margins can be pretty low. Just like retail customers, chefs definitely appreciate a chance to test out microgreens they may not already be using. Prove to them your product is high quality and give them enough to try out on several dishes. Follow up by asking what they thought of the new product and if they want to place an order. Chefs appreciate a farmer who can take feedback openly. It’s a real trust-builder! Make sure you are always ready and happy to address any questions or concerns they have, and make this totally apparent by routinely asking them for feedback. A good time to ask for feedback is after you have served them for 30 days and then yearly or twice-yearly afterwards. You can do this by creating a simple Google Form and sending them the link in an email. I always like to offer wholesale customers the option of purchasing a fixed amount automatically each week (or twice weekly). Chefs and grocery store managers are so freaking busy that they sometimes just plain forget to follow up with you each week or respond to your fresh sheet email. If they indicate they are ordering the proper amount (either by giving you consistently similar orders or just by telling you), then offer to make it an automated order each week so they no longer have to think about it. And they can always just let you know if they want to increase (hopefully!) or decrease their recurring order size. Like I mentioned earlier, these commercial customers are insanely busy and oftentimes forgetful. If they have ordered recently and don’t respond one week, follow up with an extra email or text message reminder the day before you harvest. This is on my schedule as a regular weekly task (schedule included with Microgreens Business course). As a kind gesture, invite chefs out to your farm for a free private tour. They love connecting deeper with the food they use in their restaurant and sharing that story with their customers. Don’t forget to capture pictures to post on both your social media accounts. Heck – if you think they are pretty awesome people, invite them to your bonfires, kids birthdays, or whatever other events you put on for friends and family. In other words, actually become true friends with them. A great way to guarantee a lifelong customer while bringing more joy and friendship into both your lives. It’s an even more amazing tool when you are using it to promote cool stuff other people are doing including special events and promotions at local restaurants and grocery stores that you serve. They will really appreciate it and probably reciprocate at some point. Complete the cycle of value and prosperity. In order to keep money flowing into your own life, you have to also ensure it is flowing into others lives. Return the favor by supporting the local restaurants that support you. Try to eat during a non-busy time of the day so you have the opportunity to say hi to the chef and ask how life their life and restaurant is going. One potential hurdle for microgreens producers is only having one main product – microgreens. This may result in the chef/restaurant produce buyer having to deal with more vendors which increases the complexity of their jobs. If you have the space to start an outdoor garden (can always borrow other people’s yards like I do), you can start growing a variety of produce and selling those to the chef as well. This creates a win-win situation that further increases your revenue and product/income diversity. If you are looking to do this and expand out from just microgreens, I highly recommend starting with salad mix, salad turnips, arugula, and radishes as some great high-value and quick turn-around crops. Consider changing your pricing to incentivize chefs towards ordering more. This might give them the break they need to use them in more dishes and therefore order more from you. When you drop off samples of new products, offer the chef 25% off their first order of that product. This makes it easier for them to give it a try. Once they find some dishes they like to pair it with, they will likely continue to order with standard pricing. Promise me right now you won’t just read this information and forget about it. So don’t just read about this stuff and think you have accomplished something. PUT IT TO ACTION!! I challenge you to print this off, or at least browse back through the above list and write down at least 2-3 things you plan to implement within the next 30-60 days. Reserve the time in your calendar you need to complete the tasks. Or better yet, take massive action and reserve an hour today or tomorrow to get started with this process. Thanks so much for reading! I hope you are feeling inspired! Which of these tips are you going to implement? Do you have any more ideas for adding value? Leave me a comment below, I’d love your input! !